County Comm just came out with their new Embassy pen, which features an upgraded design. The new edition does away with o-ring seals and is instead built with an internal threaded housing for greater durability. There are two versions available – one with an anodized aluminum body ($44.50), and one with a stainless steel body ($55), both with machined knurled grips. These pens take Fisher Space Pen ink refills for reliable writing. Both pens are made in the USA, and are listed as being in limited supply. The prices mentioned above were accurate as of the date of this posting. It’s got a slightly different take on the “tacpen” concept—it’s a bit reminiscent of a 7.62 x 51 cartridge and seems to really embrace the military tac-chic. I really didn’t see the cartridge resemblance before, but definitely see it now! These are about as tacticool as pens come. I can see how the styling could be a selling point for many folks. Though in my case I prefer not to signal that I’m a potential threat by my E.D.C. Not that I’m in the market for one, but I wonder if someone will create one that doesn’t look nearly so tac/mil-chic—the same way that the self-defense umbrella looks 100% normal compared to a cudgel walking stick. 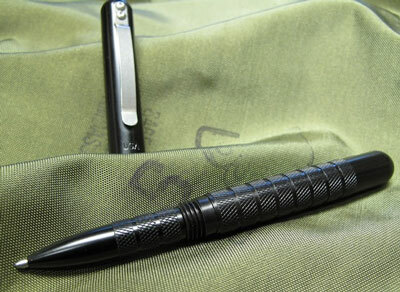 Take away the curves and knurling, and you have an ordinary metal pen. Something like the Fisher Space Pen will look a bit more reserved. Although the Space Pen (at least the few that I’ve had) is typically smaller than one’s fist when capped closed and sort of fragile when open—though I just looked up the x 750 model and that looks like a good start as a basis for a tac type pen. I’m thinking that the overall shape seems fine, but the knurling could be either done relatively uniformly along the entire length of the pen or stylized a bit. Bicycle handlebar grips—while rubber—do offer a wider variety of stylization, yet are still effective in offering grip. The knurling could also be replaced with jimping in the shape of clusters of rings for a more “modern art” look (like the Alibi pen, but more so and with metal). All in all something to diverge a bit from the standard styling that immediately says “tac pen” yet still offers comparable functionality. It could also just be that the rev 1 model sold so well that they decided to go after a similar styling for the rev 2. The Alibi pen does look pretty nice as well, and without the strong tacti-cool look.